Nouvelle finds space atop the hill just to the back of Elia Beach, part of a brand new development of private properties overlooking the fine sand and clear waters of this famous beach on the southeastern side of Mykonos. The location allows for extensive views of the bay and sunshine throughout the day, while being within a short drive from the beach, the perfect distance to either join in on the “fun in the sun” or relax around the property’s private pool. The aforementioned infinity pool catalyzes the outdoor spaces and is placed in the most panoramic part of the terrace. It can be reached both from the front terrace – which is aptly furnished for al fresco dining under a charming pergola – and from the lower level of the property where most of the bedrooms are situated. Stylish furniture is thoughtfully placed throughout while a small, lush garden blooms in the area just below. A great sense of style pervades the interiors of Nouvelle as well. Pure white surfaces dominate all spaces solely interrupted by colorful fittings. A perfect example would be the two living rooms, one per level, each boasting multicolored sitting areas with throw pillows and elegant coffee tables. The same theme is found in the property’s bedrooms, some of which might not have the same view as the others but are all appointed in a stylish manner to assure a chic ambience to all. 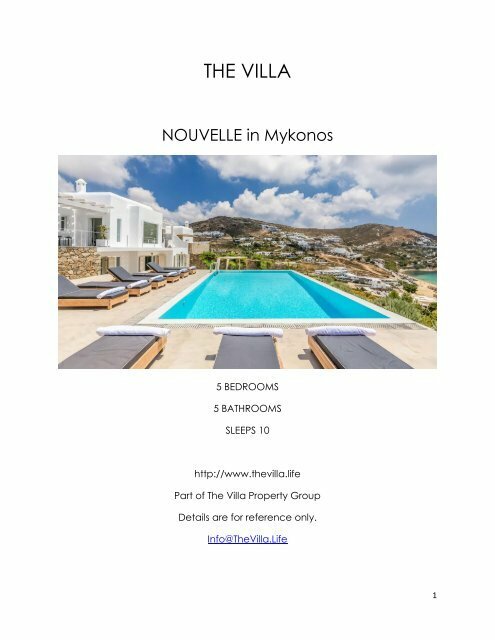 Nouvelle is a great property to get away from the more busy areas of Mykonos during the crowded summers and cherish moments of relaxation in a refined atmosphere or delve in the beach life of Elia just close by.